Prosciutto di Parma is one of my favorite things ever. If I ever travelled to Italy, I would stop in Parma to eat this dry - cured ham which was fed the whey that was used to make Parmigiano - Reggiano, the best cheese ever, also made in Parma. This is a great dish to have out for guests if you're entertaining, or as a starter for dinner. It broils very quickly, so remember to stick pretty close by if you walk away. Also always use wild - caught American shrimp. The standards are better than those from other countries, and that way you're not eating outsourced food. Eat local. Peel and devein the shrimp, leaving the tail intact. Just above the tail, make 2 - 3 slices across the inside of the shrimp where the tail curls. This helps keep it a little straighter. 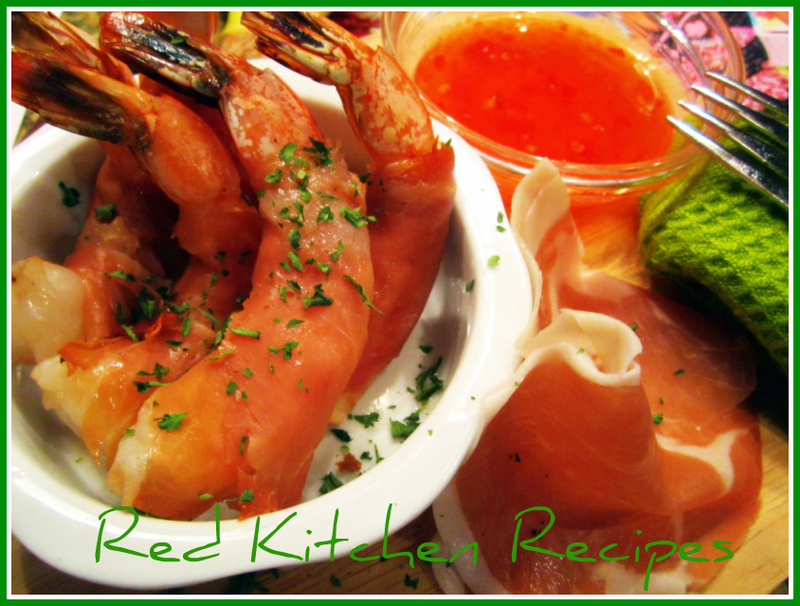 Cut a prosciutto slice in half lengthwise, then wrap around the body of the shrimp. Lay each piece onto the rack of a broiler pan. Preheat broiler. Lay the broiler pan onto the top rack of the oven closest to the broiler. The shrimp are ready in just 3 - 5 minutes, when the tails turn a deep color.